Encaustic painting is a process of heating beeswax mixed with damar resin to around 200 degrees. You can add pigment such as oil paint or purchase blocks of wax to which the pigment has been added. The hot wax mix is applied to a sturdy substrate such as a wood panel with a brush, metal tool or by dripping or pouring. Each layer is fused with a heat source such as a heat gun, iron or propane torch. It’s possible to scrape and incise the wax, as well as to collage materials into it, and to paint on it with oil paints. Layers are built up and fused, scraped back and incised and built up again. Layers can be opaque or translucent. To fuse my work, I use three different kinds of propane torches, a heat gun and sometimes an iron depending on what I want to do. The final painting is buffed with a soft cloth to bring out the shine of the wax. This ancient and durable medium has a mystery, luminosity and organic qualities that give the final pieces a spiritual feeling. This is my fourth year of working in encaustic and I discover new things about it everyday. It is unpredictable which I enjoy. As you build up layers, it’s possible to scrape down when it has cooled and find something you had covered that really works with the current layer. 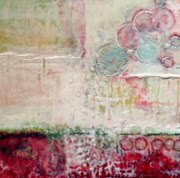 An encaustic painting is durable and archival. There are encaustic paintings from Greco-Roman Egypt that have survived in good condition. Encaustic paintings also need care. They will melt at 150 degrees so storage in a hot car trunk is not an option. Below freezing, the wax can crack. So, the encaustic painting needs to be kept between 35 and 120 degrees. Like most paintings, the best place for an encaustic painting, is on the wall, inside. If the surface of the painting becomes cloudy, it can be buffed with a soft cloth and it will regain its shine. The artist can make small repairs easily. 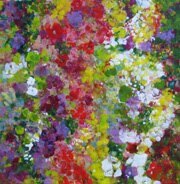 To see my website, go to: http://www.pegbachenheimer.com.